Life in the Universe is an industry sponsored project (MetaTools, responsible for North American distribution, and Navigo Multimedia, responsible for European distribution and planned translation into five languages), contracted and produced through the Department of Art Studio at UC Santa Barbara. The project is formed around an essay written by professor Hawking appropriately titled Life in the Universe. In addition to Hawking's lecture are five articles from a special issue of Scientific American also titled Life in the Universe, which are used to elaborate on key concepts raised in the lecture. The articles are written by luminaries in their respective fields, such as Univeristy of Paris professor of geophysics Claude Allegre, Princeton professor of physics James Peebles, Harvard professor of biology, geology, and history Stephen J. Gould, among others. 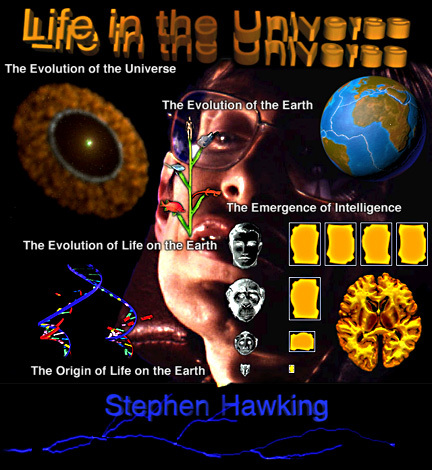 It is the second in a series of CD-ROMs done in collaboration with professor Hawking, the first of which was an international bestseller (The Brief History of Time). Due to the richness and density of the information associated with this CD-ROM/WWW project, it seemed appropriate to make exploration of environments and the acquisition of knowledge through those explorations the driving forces behind the user's investigations. This motivation differs significantly from many CD-ROM projects which are designed more as games to be "won." In this case, navigational metaphors become very important, and contain a logic that relates to the content being studied. Ideally the interface will entice the user into wanting to learn more, as opposed to functioning merely as a window-dressing or "tool" for getting to the data. Thus, the interface becomes a kind of "data" in itself as pathway histories are generated, and as navigational metaphors change in relation to those pathways. Ultimately, for the user, knowledge becomes power, and when enough knowledge/power is gained, new horizons are opened to inspection. Stephen Hawking is the author of A Brief History of Time, which graced the bestseller lists for more than 100 weeks, sold more than 5.5 million copies, and has been translated into thirty-three languages. He is also the editor of Stephen Hawking's A Brief History of Time: A Reader's Companion. He presently holds Sir Issac Newton's chair as Lucasian Professor of Mathematics at Cambridge University.